Connect to a Public [unsecured] WiFi network from a laptop or tablet. There are a few things to consider, when connecting to Public WiFi. Is it secured? An icon overlay showing an exclamation point inside of a shield denotes an unsecured Public network connection. Special care should be taken, when connecting to this type of WiFi. 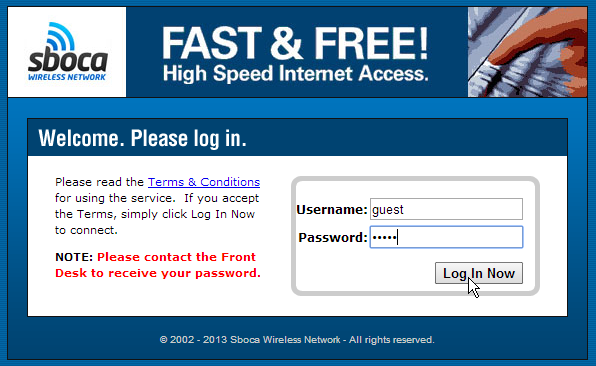 Even though you might have to enter a log on password, read a privacy statement and accept a Terms and Conditions agreement in order to connect, information shared over this type of connection might be viewable to others; such as document and internet surfing history, user names & passwords. Windows (Microsoft) is networking software; meaning that files, folders, printers and other devices can be shared with others in either an Office or Home Group environment. You can disable sharing, but this still isn't enough! Using a secure Browser such as Tor (The Onion Router) will keep your browsing history secret by providing "anonymity on the Internet." Still, you'll need to make changes to your surfing habits in order to secure that anonymity. Using a personal VPN (Virtual Private Network) to encrypt data information on public WiFi networks can prevent sophisticated hackers from tracking, monitoring or intercepting your web activities. Are you ready to connect? 1. Click the icon next to the clock, in the lower right-hand corner of your screen, which looks like cellphone reception bars. 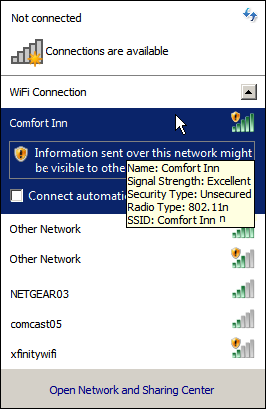 This opens a window showing all of the available wireless connections within range. On tablets, you will see available wireless networks, once you go into the Settings menu and click on WiFi. If you have never connected through WiFi before and do not see this icon, check to be sure that your Laptop has built-in capability; some older models do not. In Windows Help (F1) search the term "Enable or disable a network adapter." Click the first link Enable or disable a network adapter. In the results, Click to open Network Connections. If equipped, you will see your Wireless Network Adapter listed. [If not, you will need to purchase a USB Network Adapter.] Right-click on your adapter and check to see that it is enabled. Click on Connect / Disconnect to open the adapter interface showing available connections. ﻿3. Set the Network Location. When you connect to any WiFi network for the first time, Windows will prompt you to identify which type of network it is. Each type of wireless network, Home, Work and Public, requires different levels of security. This sets the appropriate level of firewall protection for that type of connection. Read and aknowledge the protection provided for the type of network you have selected. At this point, you now have an active connection which allows for Windows and your Antivirus protection program's to auto-update. Close the Network Location window. * Tor (The Onion Router) is a secure internet browser. * Use personal VPN software, such as CyberGhost VPN, to encrypt your data transmissions. * Wired connections transfer data faster than wireless. Even so, desktop computers can go wireless too! * Information shared across non-secured wireless networks may be visible to others. * With each program exception (open port) you add to your Firewall, you create another possible entry-point for Hackers to exploit!